Scarlett Mew Jensen and Yasmin Harper won their second Grand Prix title of the season with an improved performance in Singapore. The English pair scored 278.58 for their five dives to finish ahead of pairs from Australia (272.49) and South Korea (272.22). Mew Jensen (Dive London) and Harper’s (City of Sheffield) tally was a progression on their 251.13 to win gold and 252.00 to land bronze at the previous two legs of the FINA Grand Prix series in Bolzano and Kuala Lumpur respectively. The teenage pairing also won the British senior title earlier this year, while they landed bronze at the European Junior Championships in Bergen, Norway. Having won synchro gold, both divers competed in the individual 3m competition in Singapore. Mew Jensen scored 290.20 to qualify for the final where she finished sixth on 261.80. Meanwhile, Harper finished ninth on 201.25 in the semis, having scored 227.05 to progress from the prelim. 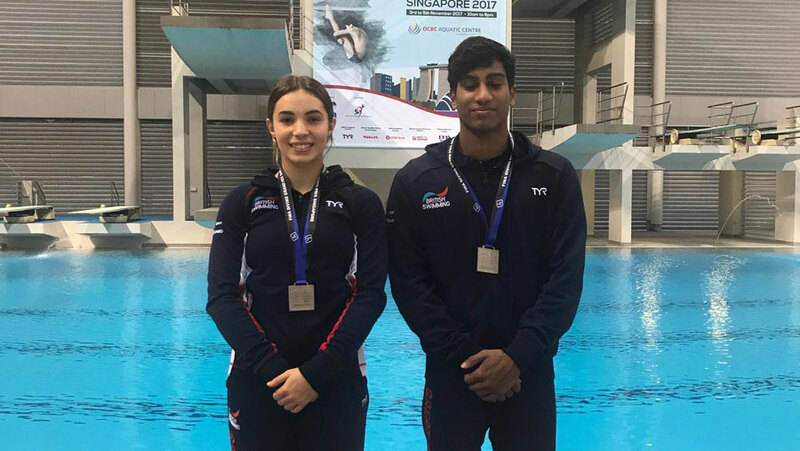 Kyle Kothari stepped on to the individual 10m Platform podium for the third successive Grand Prix with bronze in Singapore. Having won silver in Italy and bronze in Malaysia, the Dive London diver scored 413.95 in the final to finish third again. The 19-year old’s score was his best of the three finals, while his 421.55 tally from the semis was a six-dive PB. Kothari also picked up a pair of synchronised medals at the three day competition. He combined with Mew Jensen as the pair scored 275.04 for silver in the Mixed 3m Synchro. He also finished second of two pairs in the Mixed 10m Synchro, scoring 274.26 alongside Crystal Palace diver Eden Cheng. Cheng reached the final of the individual 10m Platform, scoring 215.00 to place sixth after qualifying from the prelims on 273.35 and semis on 269.10. Teammate Emily Martin also reached the semis, finishing eighth overall on 237.45. The pair also combined in the women’s 10m Synchro, finishing third of three on 250.62. Finally, City of Leeds’ Anthony Harding finished sixth in the men’s 3m Springboard. The 17-year old progressed from the semis with 387.30, before dropping slightly to 372.35 in the final.